"Oh, yes, yes, what the dickens does come next? C'est la question, ma très chère demoiselle!" Frau Consul Buddenbrook shot a glance at her husband and came to the rescue of her little daughter. She sat with her mother-in-law on a straight white-enamelled sofa with yellow cushions and a gilded lion's head at the top. the Consul was in his easy chair beside her, and the child perched on her grandfather's knee in the window. "Tony," prompted the Frau Consul, "I believe that God—"
But now Sesemi Weichbrodt stood up, as tall as ever she could. She stood on tip-toe, rapped on the table; the cap shook on her old head. "It is so!" she said, with her whole strength; and looked at them all with a challenge in her eyes. She stood there, a victor in the good fight which all her life she had waged against the assaults of Reason: hump-backed, tiny, quivering with the strength of her convictions, a little prophetess, admonishing and inspired. "What does this mean—What—does this mean..."
"Well. now, deuce take it, c'est la question, ma très chère demoiselle!" Madam Buddenbrook was sitting beside her mother-in-law on the sofa, its clean lines accented with white enamel and a golden lion's head, its cushions upholstered in pale yellow; she first shot a glance at her husband, the consul, who was seated in an armchair beside her, and then came to the rescue of her young daughter, who was perched on her grandfather's knee near the window. But then Sesami Weichbrodt raised herself up to the table, as high as she could. She stood on her tiptoes, craned her neck, rapped on the tabletop—and her bonnet quivered on her head. "It is so!" she said with all her strength and dared them with her eyes. There she stood, victorious in the good fight she had waged all her life against the onslaught of reason. There she stood, hunch-backed and tiny, trembling with certainty—an inspired, scolding little prophet. H.T. Lowe-Porter held the exclusive rights to translate Mann's major works for fifty years. In that time, her translations came under critical attack for being inaccurate, fanciful and clumsy. Yet they couldn't have been all that bad because it was Lowe-Porter's translations that brought recognition of Mann as a literary giant to the English-speaking world. Many a reader owes an appreciation of books like Buddenbrooks, The Magic Mountain and Doktor Faustus to Lowe-Porter—and many still prefer her versions over other translators'. In fact, Lowe-Porter collaborated with Mann on the English translations of his books for thirty years. Buddenbrooks was their first project. 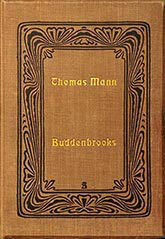 It met with mixed reviews when it was published in 1924 but, as Mann grew popular through Lowe-Porter's translations of his other works, it was picked up and republished in hardcover by the Modern Library and in paperback as a Vintage edition. For many years it was ubiquitous. Lowe-Porter famously had difficulty rendering German dialects and tended to smooth speech into a bland English, or even to skip troublesome passages altogether. She also censored some of the cruder references of the text (though there is not much crudity in Buddenbrooks to begin with). Nonetheless, no one dared attempt another translation of Buddenbrooks until John E. Woods took it up seven decades after Lowe-Porter's version. His 1993 publication was immediately acclaimed as being more accurate, clearer and more plainly written. It has replaced Lowe-Porter's version so thoroughly that it is hard to find the older translation. Some copies listed online as being by Lowe-Porter are actually the Woods editions. Your best bet to find the earlier edition may be public libraries. The Berlin-dwelling Woods is especially good with dialogue, compared to Lowe-Porter. In Buddenbrooks however I find his attempts to make German speech relevant to an English-speaking audience annoying at times. For example, a character who works as a servant is liable to use "ain't". Tony Buddenbrook's second husband Alois Permaneder, an unsophisticated character from Munich, speaks like an American country hick with his "durns" and "l'ils" and "sho' nuffs". But this is probably closer to what Mann was trying to get across in his characterization. The reader gets a more raw, less refined, and occasionally more humorous vision of the life and decline of the Buddenbrook family. Still one can see that Woods borrowed quite a bit from Lowe-Porter's first take and he must have used it as a guide. Think of his translation not as a wholesale revision but as an upgrade for the Lowe-Porter version, filling in the gaps, correcting mistakes and adding a few creative ideas of his own.